Jerika Ejercito says there are two reasons she has decided to stop all communication with Bernard Palanca, the father of her son: the welfare of her son Isaiah and her approaching marriage to her Spanish fiancé. There is no more communication between Jerika Ejercito and her ex-boyfriend Bernard Palanca. This is out of respect for her Spanish fiancé Miquel Aguilar Garcia. There is, of course, the matter of Jerika and Bernard being parents to their son Isaiah. The pretty eldest daughter of Manila Mayor Joseph Estrada and Laarni Enriquez acknowledges this. “I didn’t cut. I can never cut. He’s the father of my son. "Maybe now, I just decide to do what’s best for my child." As it stands, Jerika says she is alone in bringing up their two-year-old son. She says she does not ask support from Bernard for their son. “Nothing at all. I don’t need to ask. "If he wants to give, he can, but I will never ask." 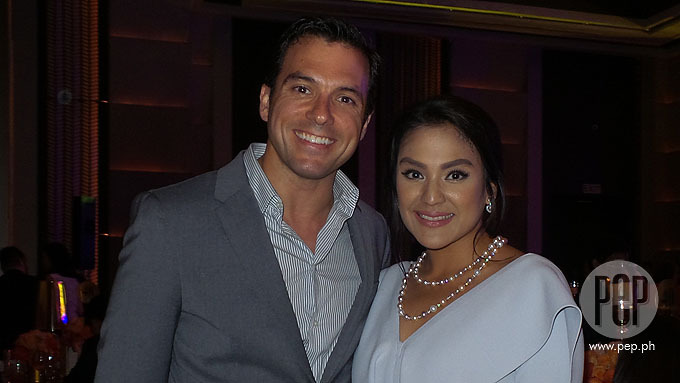 PEP.ph (Philippine Entertainment Portal) had an exclusive interview with Jerika at 80th birthday celebration of her father Erap, which was held at the Fiesta Pavilion ballroom of the Manila Hotel, last night, April 19. A BEAUTIFUL SURPRISE. It was on April 12 that Jerika's Spanish boyfriend, Miguel Aguilar Garcia, proposed to her. This happened in the The Dead Sea of Jordan. Jerika says she did not expect it to happen then. Clearly thrilled, she said, “No, I didn’t. I was actually expecting it on my birthday, June 2. "But he surprised me, and it was a beautiful surprise. Why does she think she and Miguel clicked? Smiling, Jerika answered, “Maybe we were ready for each other. "I am ready for serious commitment, he was also ready. "I think it was God’s timing." Does she see herself growing old with her fiancé? “Absolutely!” Jerika was quick to answer. She also admits that she felt differently when she was with Bernard. There are no details as yet of her church wedding to Miquel, but they are certain to get married civilly first. "We’re hoping we can do the civil by August or September. "Maybe here, maybe Spain—we still have to decide."